The Auster was designed in England by C.G. Taylor, who had originally worked in the United States with Piper Aircraft and had been responsible for the design of the Piper Club. The Auster came into it’s own during World War 2 when it was used extensively as an air-observation platform, and in the post-war years a bewildering variety of models were offered to the civilian market. The Auster J-1 B Aiglet appeared in 1950 and around 30 of these aeroplanes were imported into Australia, usually in kit form for assembly by Kingsford Smith Aviation in N.S.W. 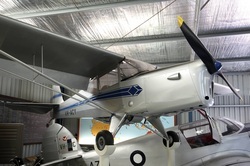 The Museum’s Auster Aiglet, VH-ACY, arrived in Australia during 1952 and passed through a variety of owners. At one time it was used in Tasmania to ferry campers into the inland beaches of Lake Pedder before the lake was flooded as a hydro-electric dam. In 1979 the Auster was retired and stored. In 1992 the aircraft had once again been restored to airworthy condition when it was acquired by the Museum.